I pick the artists that I license because they are amazingly talented and I love their work. My painters work hard to keep all that beautiful detail in the art when they paint it on the canvas. 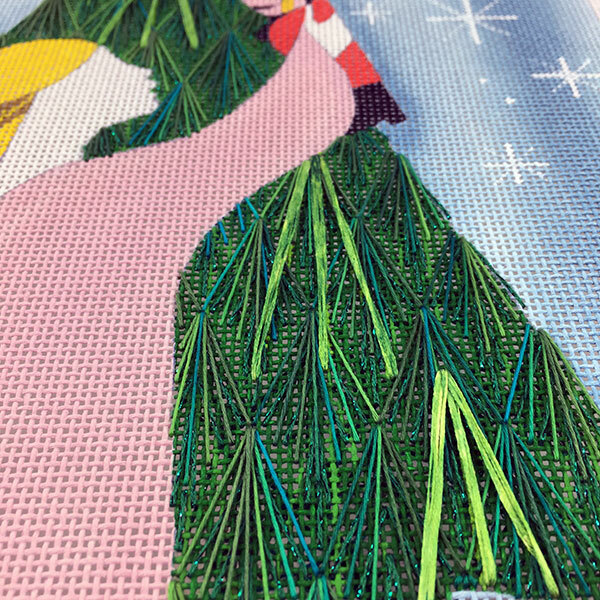 When I select stitches and techniques for the canvas, I try to honor that talent and again keep as much of the detail as possible. Eleanor Grosch is a very graphic illustrator. 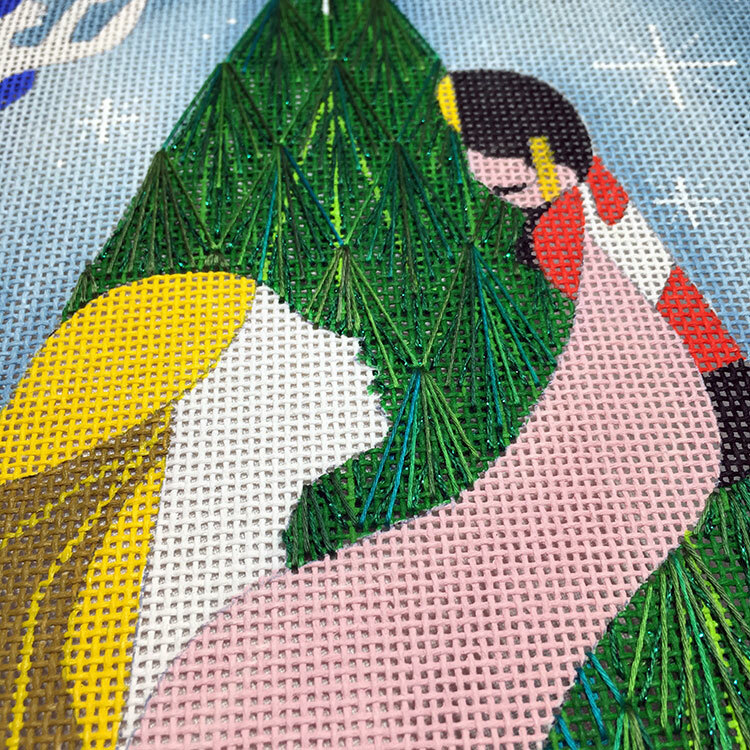 When I stitch her canvases I select stitches that will mimic the graphic nature of the design. Big and bold! 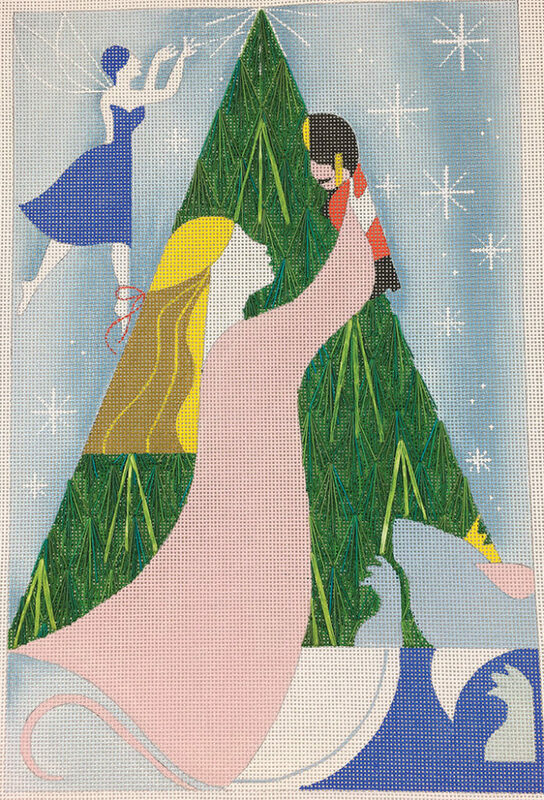 For the first lesson of the Nutcracker, we stitched the tree. While yes a partial eyelet stitch on the tree is a rather obvious choice, I designed one that has the same proportions as the tree itself. 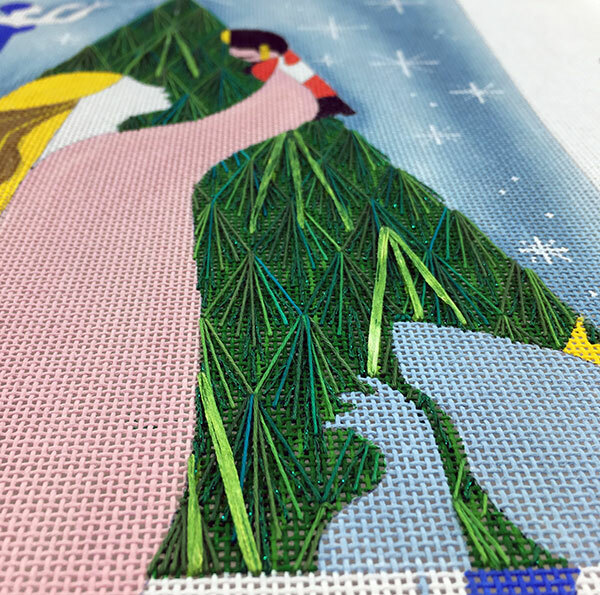 Keeping the proportion of the stitch the same as the proportion of the painted shape means pretty edges. Not too many funky compensation stitches on the edges of the tree. The stitch is worked in two steps. The first step is Petite Silk Lamé Braid and the second step is a new color from my Color Dreams line of limited edition hand dyed floche. You can see there are bright limey lines peeking through the stitches. These were added sparingly with Straw Silk. I purposely didn’t lay my stitches as I wanted more texture. I kept the feeling of the original art and didn’t lose any details! Lesson one also includes basketweave which you know I didn’t get to. LOL. Lesson two is December 16. We have canvases in stock and can send you a kit asap if you would like to join the fun. Here’s the link. « Previous Mystery Post: The Nutcracker! And that’s why I LOVE your stitch guides, Ruth:)! !